I feel like a collared dog. I was just chasing a cat and suddenly a sharp lightning strike struck me, tingling all over my body. But it was me, I was the one who *zapped* me. I was the one who punished himself for his own shortcomings. That is what the Pavlok does. 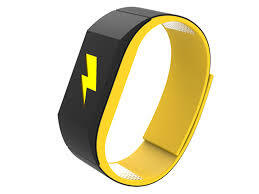 The Pavlok is a wristband and when you press its’ button it gives you a (tiny) electric shock. Electric shocks are often painful and anxiety evoking. So if there is a certain event (like a bad habit), and you shock yourself at that moment you feel pain and anxiety. Over time you’ll start to associate this event with pain and anxiety, without even the need of zapping yourself (as Pavlov’s experiments showed us). Therefore, the theory is that you’ll just terminate the bad habit to prevent the pain and anxiety. I have my bad habits too. I have a coughing habit. My girlfriend calls it my “psychological cough”. Every few months I have this cough, I start to cough for a few weeks without having a sore throat or whatever. I just cough a few times a day which are in my view very unnecessary. Therefore I was determined to stop this bad coughing habit. So what easier options are there than just zapping yourself for your bad behavior? My goal for the past weeks was to find out if I can stop my psychological coughing by using the Pavlok. First I tried to assess the effectiveness of the Pavlok by the following method; I wore the wristband every other hour on a particular day. I quantified how many time in coughed using the Taplog app. At nine in the morning I started wearing the Pavlok and at 10:00 I took it off at 11:00 I wore it again, and so on. In the next graph you can find how much I coughed that day. You can see that I coughed more frequently while wearing the Pavlok compared to not wearing the Pavlok. I coughed 14 times while wearing the Pavlok, and only seven times when I was not wearing the Pavlok. However, while coughing and quantifying I found that my coughs were very situational dependent. From 12:00 – 13:00 I was having lunch with my colleague’s and at 6:00 PM I was visiting friends and doing groceries with them. I spent the whole evening with them but after an hour I was feeling more comfortable what therefore reduced my coughing. So the first thing I learned was that my coughs were triggered by social interactions. I had the feeling that, although the data showed otherwise, the Pavlok did not really influenced my coughing that much. Therefore I needed to redesign the experiment to really assess the Pavlok’s influence on my behavior. Therefore I needed to expand the experiment with a few days. I needed a baseline measurement where I did not wear the Pavlok for a day, followed by a similar day of wearing the Pavlok. In that way I could compare the results. On the first day I only quantified my coughs, and on the second day I zapped myself when I coughed and quantified my coughs as well. Both days are displayed in the next graph. The figure shows that on the “No Pavlok day” I coughed 17 times and on the “Pavlokday” I coughed 19 days. A difference of two coughs is not much. Therefore we could say again that the Pavlok was not really effective. 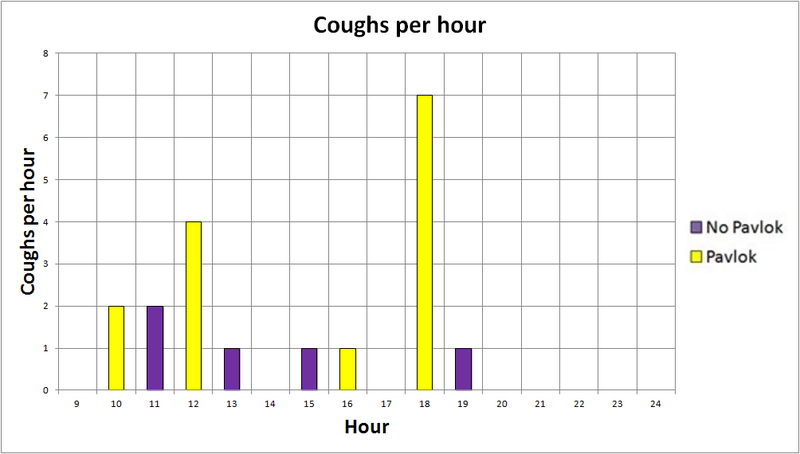 Furthermore, I compared my activities of these days with my coughing data. I found again that coughing was very much associated with social events during the day. On both days I met some people at 9:00 AM and therefore I coughed more. Furthermore, at six PM I met friends to eat with them. To follow the rhythm of the experiment I did not wear the Pavlok on day four and did wear the Pavlok on day five. I still quantified my coughs and the found that on day four (No Pavlokday), I coughed nine times and on day five (Pavlokday) I only coughed two times. With the Pavlok I coughed less. Nevertheless, this could also be a time effect, because if you compare these days with day 2 and 3 you can see that my coughing frequency definitely reduced. My cough was losing terrain! I did not wear the Pavlok again on day six and did not cough at all that day. I lost my psychological cough! Hooray! In six days I got rid of my coughing habit. Usually this takes much longer for me. So you might say that the Pavlok helped me to stop coughing. However, the data did not really show this. The Pavlok did not reduce my coughing frequency directly, and I think it did not make me afraid for coughing. I did not really care for the electric shocks, they were annoying but I got used to it after a few shocks. Nonetheless, the Pavlok did something else, it made me conscious about my coughing. 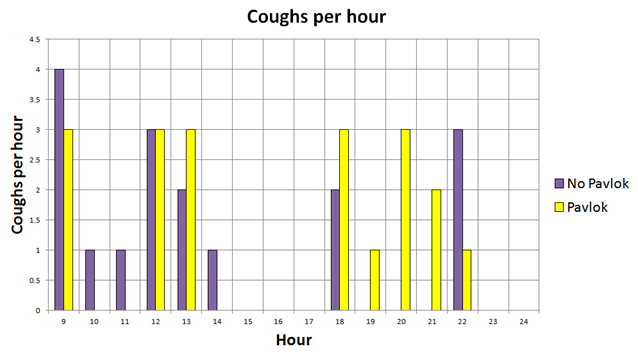 By putting attention to my coughing behavior, I learned about my coughing pattern. I started to realize how much I coughed per day and when I coughed. Most importantly, while reviewing the data I learned what my psychological reasons were to cough. I learned that social interactions were a huge part of my reasons for coughing. I probably did this (unconsciously) to give myself some time to respond to a question for example. Now I know this, I have the power to (try) suppress my psychological cough responses during social interactions. Isn’t this just what Quantified Self is about? With quantifying your behavior you’ll get more conscious of you (automatic) behavior. Every time I coughed in this period I zapped myself + I quantified my cough in an app, making me more conscious. Just writing about your behavior using an app isn’t that strongly compared to a *zap* from the Pavlok. The electric shock really zaps you away from reality and your automatic behavior. This makes you very conscious of your unwanted habits. Therefore I think there is some added value to the Pavlok zapper. Will it work on you as well? Don’t expect from the Pavlok to cure your bad habits instantly. The Pavlok can’t cure you; it just makes you face your “disease”. Furthermore, more difficult habits like smoking addictions will be harder to get rid of. Still, zapping yourself might give you an extra (extreme) stimulus to think about your mind behind your behavior. This cough was a highly personal case. I can’t compare this cough with other coughs or other cases. Actually you still can’t even say firmly that the Pavlok did anything because you don’t know how long a normal cough would last (maybe also six days?). In my own experience my cough usually lasts longer than this, so based on that and my acquired knowledge I made my conclusions. Suppose you want to quit smoking; I think you’d better zap yourself while thinking of smoking instead of zapping during smoking. If you zap yourself at the core of your behavior (during your thoughts) you have better changes in changing your actual behavior. In this experiment I zapped while I was coughing, nonetheless I think that zapping just before coughing might be even more effective. I was not able to do this because coughs were sometimes very spontaneous and I couldn’t prevent them.